This face wash is probably one of my budget skincare finds of the year. As it’s a cream wash it’s less harsh than it’s gel counterparts but still manages to help unclog pores and keep my skin clear. The bonus? It’s only £4.99. 2014 was the year that I decided that I needed some chemical exfoliation in my life, and with that came the much hyped Liquid Gold. At first I wasn’t overly impressed, but it’s more of a slow burner (not literally) than a quick fix. I do love the tingling feeling when I use this but it isn’t overly harsh on my sensitive skin. For a really intense fix I apply my Pai Rosehip oil after and I wake up a new woman. I shied away from manual exfoliators after realising they were making my blemish prone skin worse, but after picking this up on a whim in France it’s renewed my faith in facial scrubs again. This is so so gentle but does a really effective job of clearing away dead cells to keep the skin glowy and fresh. It smells lovely and I have been using it a lot more than originally anticipated meaning I’ve got a bit of a conundrum about repurchasing as it’s so damn pricey. Another product I’ve been using to give me plump hydrated skin is the Pai BioRegenerate Rosehip Oil. It’s distinctive in both scent and colour but not unpleasant. Pai is a brand I’ve really been enjoying in 2014 and I’m excited to try more from them, especially if everything is as good as this oil. Lush Tea Tree Toner water is another of my budget finds this year and it’s every bit as good as more expensive toners out there. It’s refreshing and helps to wake me up in the morning as well as being an integral part of my routine when I’ve got the breakout of the century. Move over Hydraluron this is way better. I’ve learnt a lot about my skin this last year and it gets very dehydrated but a night time application of this and my skin is plump, glowy and I almost look 18 again…I wish. It seems to regulate oil control and generally just a good all rounder that sinks in quickly leaving no sticky residue so you can apply your favourite night cream over the top. This has recently hit shelves in the UK and I know many people are dying to try it, but I grabbed a fair few bottles back in September on my holiday to France and I have to say, I do love it. It’s very gentle, so much so that I have used it to soothe my dermatitis too. I absolutely wouldn’t be without this in my arsenal. I recently did a review here raving about this cream as it’s just exceeded all my expectations for a drugstore anti-blemish cream. It makes a really good primer and it’s super effective at helping to fade red marks. I’ve been banging on about this face mask all year, I absolutely wouldn’t be without it and I even recently featured it as one thing you must buy this month. It’s fabulous for keeping pores unclogged and spots at bay. This is again another French purchase, but I really like it. It’s very gentle but leaves my skin really soft. I also like how it works in that you don’t let the mask dry so it doesn’t leave your skin feeling stripped and tight. 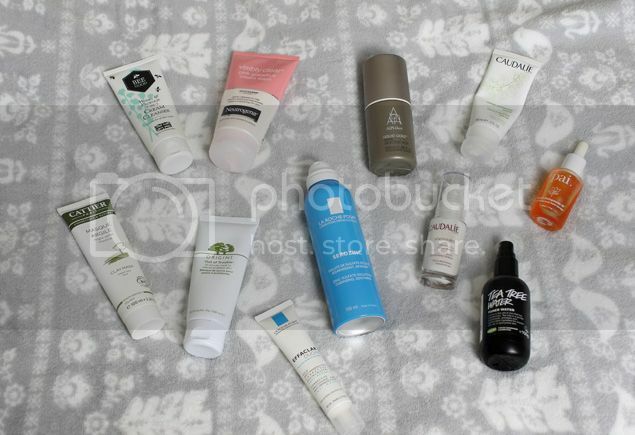 So there you have it, my skincare favourites for 2014. I’ll be posting later about my makeup favourites for 2014 and the best of the rest. Looking over this post now I can see I’ll definitely have to make a trip across the channel soon to feed my addiction to French skincare. Paris anyone?